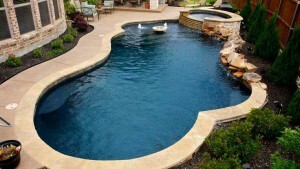 DF Pools & Spas Recommends Diamond Brite Pool Plaster Finish For Extreme Durability And Years Of Pool Use And Enjoyment. Diamond Brite Pool Plaster Finish is factory blended with natural quartz aggregates and fortified white polymer modified Portland cement ideal for new or resurfaced swimming pools. Available in a variety of colors and textures. Diamond Brite pool finish is extremely durable and attractive alternative to traditional pool marcite coatings. Diamond Brite brings unparalleled beauty to swimming pools. The lustrous and colorful surface gives the pool a whole new charm. Yes, there are a variety of colors available and a wide range of patterns to choose from. This gives you an opportunity to give a completely new look to your surroundings. Diamond Brite is also considered a lot safer than conventional paint. Although the surface looks shiny, it is slip resistant. This makes it an ideal pool polish for parents who are concerned about the safety of their kids. One of the most distinguishing features of a Diamond Brite surface is that it is highly durable. You won’t need to get it polished for a long time and the surface will continue to look lustrous and beautiful. The emulsion contains a high resistance formula that is able to bear the most powerful detergents and pool chemicals. Paint surfaces can catch rust more easily than a Diamond Brite one. Once you give your pool a Diamond Brite finish, you will delay its maintenance for several years to come. Call today (954) 740-1585 and let our professionals provide you with a free quote. Our exclusive Diamond Brite pool resurfacing process will give you the look and feel of a new pool, and give you years of use and enjoyment. We resurface commercial and residential swimming pools and spas, no pool is too large or too small. Contact us today to get started on your Diamond Brite pool resurfacing. We will need the overall length, width, and depth of your pool when you call. Once we’ve analyzed your pool, we will give you a FREE ESTIMATE and can complete any job in a professional, and timely manner. Ready to Revitalize Your Pool? Please fill out this short form and we will contact you shortly to discuss your project. If you are interested in our services, do not wait, Contact us Today!